Sweden’s legal, financial and administrative services agency, Kammarkollegiet, which suports public sector procurement, is investing in more flexible IT and digitalised services after signing a new framework agreement. The agreement with seven separate suppliers covers information management and e-government services to the public sector, and has an estimated annual value of SEK 400m (£31m) over the next four years. Kammarkollegiet’s National Procurement Services department (Avropa) co-ordinates the buying of ICT products and services for the entire public sector in Sweden. The goal of the new framework agreement – which came into force in November 2015 – is to accelerate the ongoing digitalisation of public-sector services by making it easier for the government, municipalities and county councils to buy software and services, as well as cancel contracts. According to Lundh, the agreement makes the implementation of new technologies more flexible because authorities can easily mix different delivery models, including in-house licensing and software as as service (SaaS): “Previously we have had specific framework agreements for proprietary software, open source software and services,” Lundh said. The infrastructure, software and consulting services are provided by CGI Sweden, Chas Visual Management, Evry Integration, HiQ International, Know IT Aktiebolag, Pulsen and Tieto Sweden. 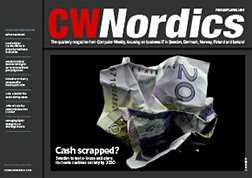 Technology developments are pushing Sweden towards a cashless society with little need for bank branches. Recent announcements point to a very different future for one of Sweden’s best-known ICT brands. Kammarkollegiet’s functionality-oriented approach has been driven by a shift from traditional licensing models towards a wider use of cloud-based services in the public sector. Madeleine Rittner Chami, head of government sector at Kammarkollegiet partner Tieto agreed. She said the way information is stored and handled will become increasingly segmented, but there is nothing stopping the public sector from adopting the same technologies as the private sector, including the cloud: “The issue is more what should you put in the cloud and in what kind of cloud, it is about security,” Rittner Chami said. "The cloud is not that widespread in the public sector yet, we’re in an early stage, but it will be far more heavily utilised in a few years’ time – especially as tailored industry specific cloud services emerge also for the public sector."